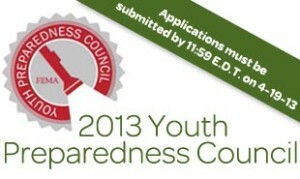 Would you like to serve on the FEMA Youth Preparedness Council? The Federal Emergency Management Agency (FEMA) is looking for young leaders, and sponsoring a national contest to find them! 1. You’re between the ages of 12–17. 2. You’re dedicated to public service. 3. You’re making a real difference in your community and know what it means to be prepared. 4. You want to expand your reach and make a significant impact as a national advocate for youth disaster preparedness. If you think you fit this description, or you know someone who does, visit FEMA’s Citizen Corps Youth Preparedness Council page to get more information and submit your application. Nominations must be received by April 19 at 11:59 p.m. EDT. This is a great opportunity for any Girl Scout who’s been affected by a natural disaster like Hurricane Sandy, and experienced firsthand what a difference helpers can make when hard times strike a community. You have the skills, and by sharing your opinions and ideas about youth disaster preparedness with FEMA leadership, you can make a difference and be a leader who helps keep citizens aware, prepared, and safe. As seen on the GSUSA's For Girl's Blog.